The Aesthetics of Research is an ongoing initiative dedicated to exploring how resources shape and inform artistic practice across disciplines--from the tangible (print & electronic media, studios/workspaces, supply sources) to the intangible (workshops, tutorials, creative communities), With a slant toward non-traditional, indie, and underground art forms, the initiative seeks to connect artists to both resources and each other, forming a thriving network of similarly minded creatives. Currently in residence at the Columbia College Chicago Library. the AofR works to develop targeted projects (exhibits, displays, programming) with an eye toward showcasing the Library's wealth of materials, engendering discussions about how those materials inspire creative work, and building interest and enthusiasm toward the collection and its possibility for artists. The AofR also seeks to form bridges and connections to related resources on campus and within the greater Chicago arts community, placing the Library at the center of a vast multidisciplinary network available to artists and other creative professionals. The project explores the concept of libraries as a creative/ intellectual space where learning happens, not only in the traditional academic structure via collaborations with faculty, but also individually driven through curiosity and self-study, as well as peer to peer, community member to community member. Each semester, AofR addresses a portion of our programming to a particular genre, art form, movement or special topic of interest via exhibits, displays , workshops, readings, lectures, panel discussions, and other activities. Focus topics reinforce the Library as a place of creative conversation and inquiry, bringing art & scholarship together, as well as explore available resources in the Library, on campus, and in the greater Chicago community. Past Focus topics include Apocalypse, USA; Tattoo: Ink, Art, and Object; HOAX! Conspiracies, Illusions and Creative Hijinks; Uncanny Specimens: Taxidermy, Preservation, and Play; and Is Anyone Out There? : LGBTQ Arts & Media. 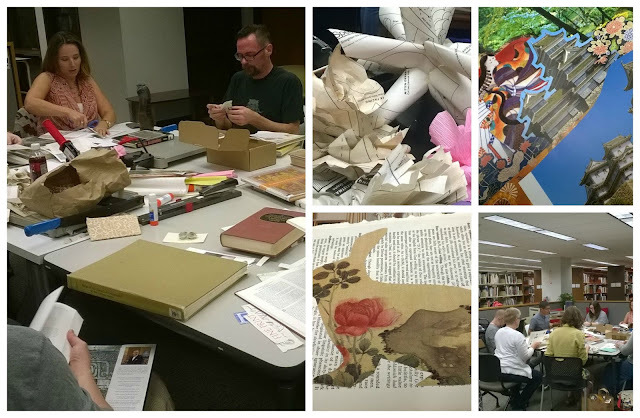 How To Tuesdays are a series of workshops and artmaking experiences that highlight certain subjects and areas within the Columbia College Library Collection--areas that are an excellent resource for practicing and developing artists. Our How-To Tuesdays seek to center the Library as not just resource den, but as a truly interdisciplinary creative community and environment, where all members share techniques and knowledge and become living, breathing resources themselves. In addition to our regularly scheduled monthly events, we also host pop-up workshops and occasional group/individual tutorials. Past workshop forms have included book arts, DIY snow globes, stamp & ink art, printmaking, upcycled art, street art forms, optical illusions, silk screening, black velvet paintings, and watercolor inking. . 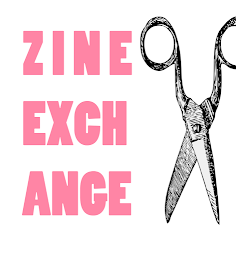 The Library's 1st Floor Zine Exchange invites the CCC Community to share zines, comics, chapbooks and other print creations, as either creators or consumers, offering an abundant and evolving collection of indie print materials. Monthly Library Zine Nights offer participants a chance to work on zines or other print/book projects, either alone or with other artists, and explore new techniques and approaches. Zine Nights are geared to create community and collaboration among Columbia's community of zinesters, writers, and artists, as well as promote zines as an excellent vehicle for student and community work. Zine Night participants also contribute to and help create AofR-created zine projects, including our very own new campus-wide arts zine, REALLY BAD IDEA. Aof R also hosts a semi-regular series of specialized zine-focused discussions and workshops, including Zines in the Classroom, and zine-making experiments at various campus and off-campus events. The Aesthetics of Research Salon Series is a regular schedule of readings / discussions with Columbia & Chicago Community authors about their work and the materials/ inspirations from which that work springs, with a particular eye toward how libraries and research in particular inform and support the creative process. This series of readings, exhibits, panels, workshops and other programs creates pathways between the written arts and the visual and book arts with an eye toward hybrid forms and cross-pollination. Started by the Library As Incubator Project, the Book to Art Club is a book + art-making club that exists virtually and in-person at libraries around the world. a way to find hands-on, creative ways to engage with literature. Each term, a new title is chosen for exploration and to be the subject of a series of Read, Talk, Make Sessions that develop creative projects, culminating in a larger interdisciplinary campus-wide creative project. Public Domainia is a regular series exploring the wide world of films available in the public domain, from the classic to the rare, the brilliant to the horrible, including an annual Halloween Double Horror Feature. Screenings offer not only a social opportunity to watch weird and wonderful films (with snacks! ), but also an informal chance to work on creative crafts and projects related to the evenings features. Occuring each October during the Wabash Arts Crawl, the Festival features many manifestations of independent publishing, including indie literature, comics, zines, illustration, and book arts, and includes a publisher & artist showcase, readings, word games, zine making and more. These panel discussions, workshops, and other activities bring practicing artists, writers, editors, curators, and other creatives to the Library to explore practical and applied topics related to a life and career in the arts , including making a living as an artist, submitting your work, building your art empire, self-promotion, etc, as well as how the Library and its resources can help you in these endeavors. The 1st Floor space typically features, via themed exhibits, finished artwork from the CCC and Chicago community, exploring the role that various media, materials, and other resources inform the creative process. Located in vending machines near the Library entrance, AofR Small Works allows a chance to obtain a small, inexpensive takeway piece of art related to current Aof R programming and exhibitions, including buttons, artist trading cards, mini-broadsides, stickers, and more. The Library Sketchbook Project creates an evolving and circulating exhibit of student and CCC community work. The Sketchbooks also offer contributors an opportunity for self-promotion and exposure, foster collaboration and creative community among campus artists, as well as a forge a snapshot of the CCC community artmaking endeavors available for years to come. This hidden exhibit/ art hunt features plastic eggs containing small pieces of art culled created by community artists hidden throughout all five floors of the library. The hunt not only offers a unique opportunity for artists to feature and distribute their work, but also an incentive to the public to explore various corners of the library. Part geocache, part hidden exhibit, part library scavenger hunt, the ARTCACHE gives participants an opportunity to not only have some fun in locating the cache, but also to learn more about the library and brush up on research/problem solving skills. The cache features work by CCC community artists as takeaways, as well as invites participants to contribute small pieces of artwork when they discover it.